Floral headbands are a staple for women's Renaissance-era costumes. A wreath of flowers with ribbons cascading from the back of the headband is the perfect accessory to finish the look. They are sold at Renaissance festivals but, with a few supplies, you can make them at home for much less. Wrap a piece of ribbon around the head of the person for whom the wreath is to be made. Mark or cut the ribbon at the point where the ribbon ends meet. Lay the ribbon on a flat surface. Stretch a length of heavy-gauge wire alongside the ribbon. Use a wire cutter to cut a length of wire 2 to 3 inches longer than the ribbon. Form the wire into a circle, overlapping the ends. Wrap the ends around the wire circle with pliers to secure it. Try the wire frame on the head and adjust the wire as required to make the headband fit. Measure out 12 inches of ribbon and place a paper clip at the 12-inch mark. Set the clip against the back of the wire frame and unwind more ribbon. Wrap the ribbon around the wire frame. Once the wire band is completely covered with ribbon, measure out another 12 inches of ribbon and cut the end. Remove the clip from the first length of 12-inch ribbon. Tie the two12-inch ribbons together where they meet at the back of the wire and secure the knot with glue. 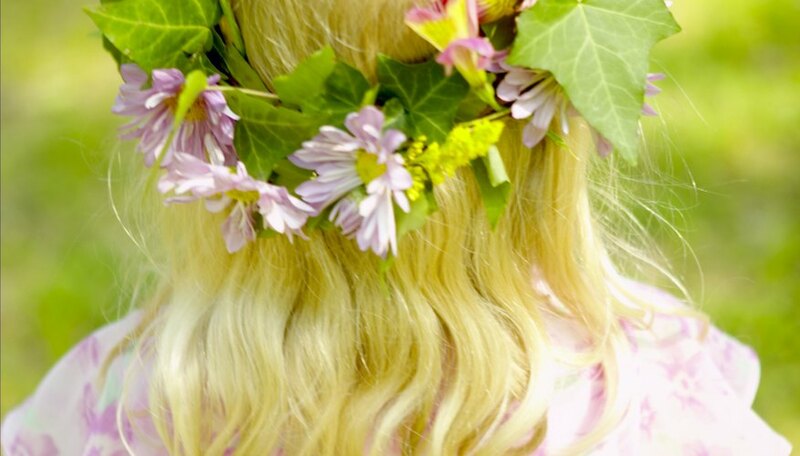 Use hot glue to attach silk flowers around the headband to form a wreath of flowers. Loosely wrap more ribbon around and between the flowers, working all the way around the headband. Tie the ribbons together at the back of the headband and secure each knot with a drop of glue. Tie additional lengths of ribbon to the back of the headband if desired and secured them with glue. Attach a small bunch of flowers or a decorative bow with hot glue to cover the knots at the back of the headband. Wrap the loose ribbons at the back of the headband tightly around some cut pieces of wire and let sit for at least 1 to 2 hours to curl the ribbon. Pull the extra wire from the ribbons. The curled ribbons can be sprayed with fabric starch to help them hold the curl. White glue can be used in place of hot glue if the headband is not going to be worn outside. The ends of the wire may be sharp. They can be filed down or wrapped a few extra times with ribbon to prevent scratching.